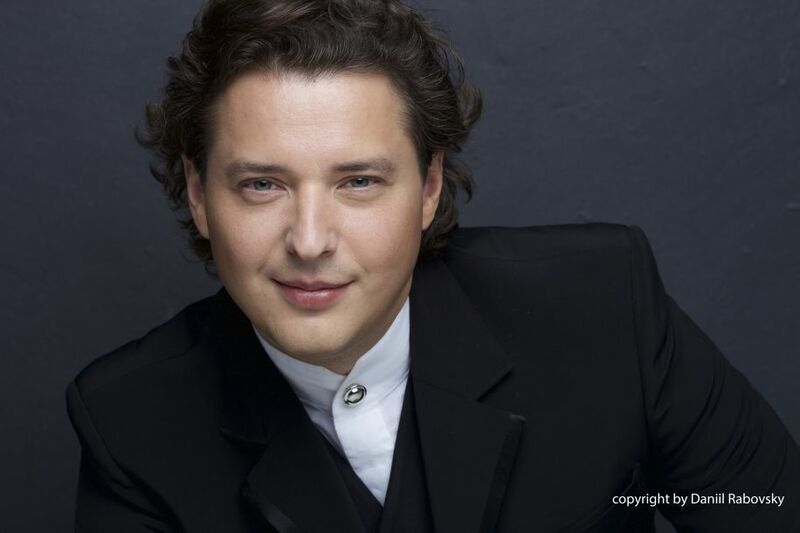 Russian tenor Dmitry Korchak is one of the most exciting and sought-after voices of his generation acclaimed by critics worldwide and regarded as one of today’s best performers of bel canto repertoire. After winning the Francisco Viñas International Singing Competition in Barcelona and two prizes (4th Prize and the Zarzuela Prize) at Plácido Domingo’s Operalia Competition in Los Angeles, both in 2004, Dmitry Korchak has rapidly become a regular guest at the world’s most renowned opera houses and concert venues. The tenor made his debut at the Vienna State Opera as Nemorino (L’Elisir d’amore) in 2008 and since then returned as Lensky (Eugene Onegin) alongside Anna Netrebko as Tatiana, Don Ottavio (Don Giovanni), and as Conte d’Almaviva in Rossini’s Il Barbiere di Siviglia, Don Ramiro (La Cenerentola) and Ernesto (Don Pasquale). Rossini’s Conte d’Almaviva took Dmitry Korchak to the Teatro Real Madrid and the State Operas in Berlin and Hamburg, the Teatro Regio di Parma and the Teatro Massimo di Parma, the Operas in Marseille and Toulouse as well as the Los Angeles Opera. At the Opéra de Lyon he sang the title role of Le Comte Ory and at the Palau de les Arts Valencia, Ramiro (La Cenerentola) and in Valencia he performed Lensky and Don Ottavio. Dmitry Korchak made his debut at the Teatro alla Scala in Milan in the part Camille de Roussilon (The Merry Widow) and returned as Conte di Libenskopf (Il viaggio a Reims). Further roles include Nadir (Les Pecheurs de Perles) with Opera Australia, the Opéra Comique Paris, the Opera Nacional de Chile, the Theater an der Wien and the Teatro di San Carlo in Naples. With the Bayerische Staatsoper he performed Nemorino and returned as Don Ottavio in 2016. At the Opéra National de Paris Dmitry Korchak could be heard as Nemorino, Ferrando in Così fan tutte and as Lord Arturo Talbot (I Puritani). A role he also performed at the Teatro Regio di Torino, the Théâtre des Champs-Élysées in Paris and the Opéra de Lyon. He also gave guest performances with the Staatsoper Hamburg (Tonio in La fille du regiment), Cologne Opera (Duca in Rigoletto), the Semperoper Dresden (Fernand in La Favorite), Zurich Opera (Tamino in Die Zauberflöte), Opera La Monnaie Brussels (Tamino), Teatro San Carlo (Fenton in Verdi’s Falstaff), the Royal Opera House Covent Garden (Nemorino) and the Netherlands Opera in Amsterdam (Nemorino). With the New National Theatre in Tokyo Dmitry Korchak sang the title role in Massenet’s Werther and Ferrando in Così fan tutte. As Endimione in Vicente Martin y Soler’s L’Arbore di Diana he was heard at the Teatro Real Madrid and the Palau de les Arts Reina Sofia in Valencia. Dmitry Korchak is a regular guest of the Rossini Festival in Pesaro. Since his debut as Ermanno in L’Equivoco stravagante in 2008, he returned as Osiride (Mose in Egitto), Giacomo (La Donna del lago), Gernando/Carlo in Armida as well as in recital singing the tenor parts of the composer’s Le petite messe solenelle, amongst others. He is also a welcome guest at the Kissinger Sommer in Germany. In 2009 he made his debut with the Salzburg Whitsun Festival, singing the title role of Niccolò Jommeli’s Demofoonte under the baton of Riccardo Muti, a production that was also shown at the Ravenna Festival in 2009, and returned as Cami in Betulia liberata by Jommeli in 2010. Dmitry Korchak kicks off the 16⁄17 season with recitals in the Tchaikovsky Hall in Moscow and in Warsaw and returns as Ernesto (Don Pasquale) to the Vienna State Opera. Later in the season he performs Oreste in Rossini’s Ermione in concerts at the Opéra de Lyon and the Théâtre des Champs-Élysées in Paris, before returning to the Teatro San Carlo in Naples singing Rodrigo in Rossini’s Otello. Rossini is also the vehicle for his return to the Metropolitan Opera, where he made his debut as Don Ottavio in 2015. At New York’s renowned opera house he performs Conte Almaviva in Il Barbiere di Siviglia. In February 2017 he can be heard as Nemorino (L’Elisir d’amore). Afterwards he performs one of his signature roles, Almaviva with the Opéra Monte Carlo and closes the operatic season with performances of Don Giovanni at the Gran Teatro del Liceu Barcelona.